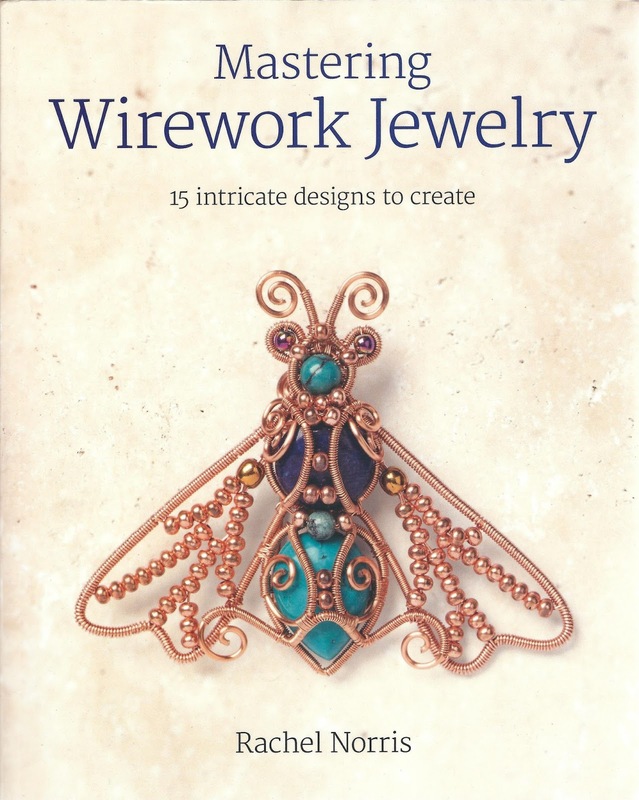 If you love to work with wire in your jewellery creations, you will almost certainly be familiar with the author of this latest wireworking book, Rachel Norris. A long-standing guest designer on Jewellery Maker TV, author of several DVDs and a regular contributor to the much missed Beads & Beyond magazine as well as other jewellery making publications, Rachel has brought together a collection of 15 beautiful projects for this, her first book. This weighty volume of over 300 pages combines gorgeous gemstones and cabochons, wonderful wire and crystals to create stunning jewellery pieces. The focus is on statement necklaces and intricate brooches and you cannot fail to notice a flora and fauna theme throughout the tutorials. You could take a dip in the ocean with the Leaping dolphins necklace, Seahorse or Little fish pendant. 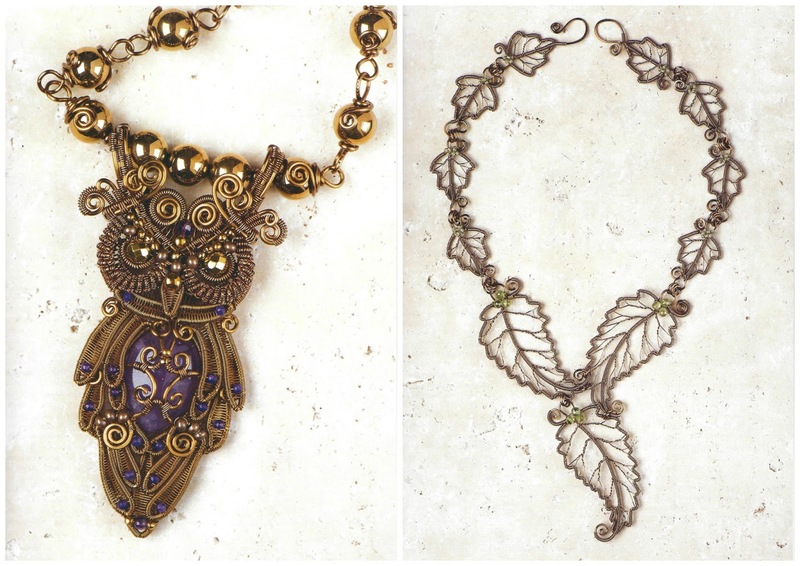 Or why not take a nocturnal stroll through the woods with the resting moth brooch (featured on the cover), Golden-eyed owl necklace or Tumbling leaves necklace? Perhaps travel somewhere exotic with projects featuring an elephant, lion or gecko. Whichever tutorial you choose to start your journey, you will find clear main photographs, detailed step-by-step instructions and all the images you need to follow the process to create a visually stunning piece. Rachel is careful to provide lots of tips and notes to help you on your way and there is a comprehensive section at the beginning of the book covering all the techniques that you will need across many of the projects. I must say that this book is not for the faint-hearted and probably not for newcomers to wirework. Some of the designs have over 100 steps so you certainly shouldn’t expect to finish something quickly. However, that being said, if you take your time and perfect the techniques first, then you will get great results. I know from editing Rachel’s projects for Beads & Beyond magazine over the years, that her clever approach in creating separate components in stages before joining them together is what makes her designs achievable and yet so visually complex. 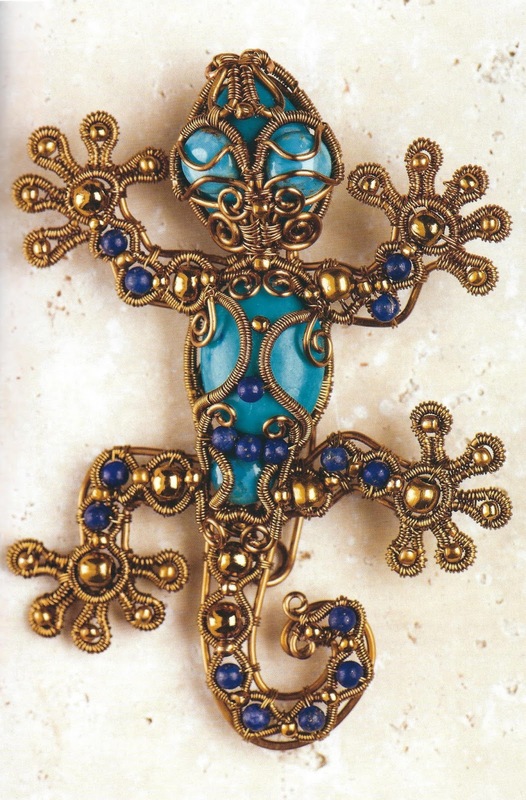 This Gecko brooch for example is made up of around 12 different components, allowing the main frame, cabochon settings and the beautiful gemstone details to be built up in layers. Rachel provides all the tools, instruction and even templates to enable you to replicate her designs. Now, it is customary for me to test out a design from the books I review but I have to admit to being a bit of a wire-phobic. So, on this occasion, I think I will hand over the challenge to our readers and members! I have a copy of Rachel’s book to give away to one lucky wireworker. Just leave a comment on this post and tell me about your travels with wire and I will pick a winner at random on Monday 31st July after midday. Look out for a bonus opportunity for another entry on our Facebook page! We’d love to share our winner’s first make from Rachel’s book so come on, don’t be shy! I have been promising myself to make Rachel's Moth ever since it appeared over two editions of Beads & Beyond Magazine about two years ago! I bought the gemstones to get a near match from Jewellery Maker and had the wire, but was not yet brave enough to try. I would love to have a copy of this beautiful book, and knowing Rachel from Jewellery Maker TV demonstrations, she is so thorough and so gracious giving of her time and providing the templates for each design and all the steps, that I am sure this book will be truly comprehensive and as thorough as her previous demonstrations. 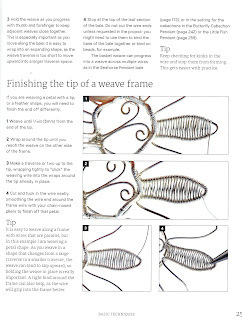 I loved her instructions in Beads & Beyond Magazine even trying out the wire Gizmo to make coils for my jewellery. Thank you Helen for the article, it is a fabulous guide and makes me want to try Rachel's designs in her fabulous book. My wire travels with me on every vacation, to every music festival, and even doctor appointments. I found viking knit helps pass the time on some of those tedious car trips, netting and weaving give ny hands something to do at concerts, and I can still accomplish something while visiting with friends and family. I have dabbled with wire on rare occasions as it scared me a little if I marked or bent it too much. Watching Rachel on television or video helps no end as she provides us all with the confidence to explore the world of wire creations with tips. Advice in breaking them down into components (which can be replaced if damaged) and time taken to correct any flaws is a fabulous approach. Having Rachel's book would complete my desire to change my dabble into addiction. I have dreams of completing specific items using Rachel's instructions to achieve wonderful pieces that my family and friends will appreciate and inherit! Thank you Rachel, you wonderful icon! I want to get more practice working with wire, I have several beautiful cabochons that are crying out for some pretty wirework, but I'm afraid I won't do them justice at the moment. I love Rachel's work and hope to be as good as her one day! Oh the possibilities & a chance to challenge myself, help me grow as a metal worker. That gecko looks amazing! I like how Rachel puts into separate sections to he joined, each one is a project in itself! Fingers crossed & Ty for opportunity! I love Rachel's work and have learnt a lot from watching her on Jewellery maker. I would love to have the chance to make something from this new book and I have plenty of wire waiting should be be the winner ! when I first started wire weaving I used Rachel's youtube videos to teach myself. I'm so happy she has put out a book. Start working with wire under the direction of the amazing Sarah Thompson. So very excited to expand my abilities with Rachel's guidance! My daughter and I both enjoy working with wire and this would make a perfect present for her birthday in August. After 3 years of medical problems that have led to isolation and depression I turned onto random channel and discovered Rachel Norris not only a magnificent and inspiring artist as a wireworker but a truly beautiful human being. How she finds the time to not just, thank others for comments on her creations but words of encouragement, advice and the ability to make each and every individual feel genuinely cared for. I would have given up long ago without this lovely talented lady's words to help me keep going. I would adore to win this book and attempt one of these wonderful designs. Having followed Rachel,s progress for the last year I confess to being star struck. The finished jewellery she produces is far beyond my capabilities but I live in hopes that one day I'll be able to complete one of her designs..